All hope appeared to be lost halfway through Ole Miss' round of 64 matchup against Wisconsin. Marshall Henderson's scorching hot shooting throughout the SEC Tournament was last week's news, or so it seemed. Wisconsin stifled the 6-foot-2 guard by repeatedly forcing him into contested looks from deep. Then, Henderson flipped the switch. 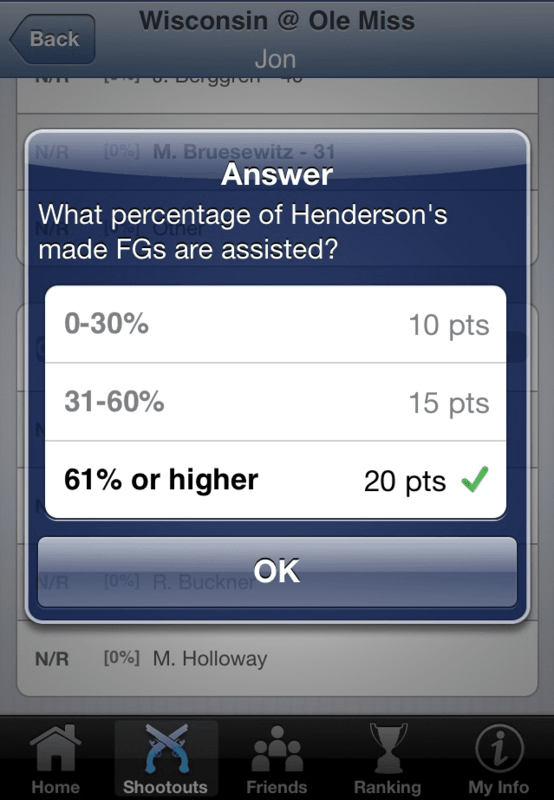 To start the game, we asked the audience to make a SnapCall: What percentage of Henderson's made FGs would be assisted? The only knock on Henderson, aside from his on-court antics, is his “me-first” demeanor. However, he is the Rebels leading scorer and they encourage him to take a high-volume of attempts without breaking the teams' offensive rhythm. As the first half unfolded, Ole Miss fans watched their beloved #22 struggle to find his range. Wisconsin made it a point to defend him out beyond the 3-point line, even switching on hard screens to keep a hand in his face. The defensive pressure got to him, and he finished an abysmal 1-of-11 in the first 20 minutes. However, there was a silver lining. 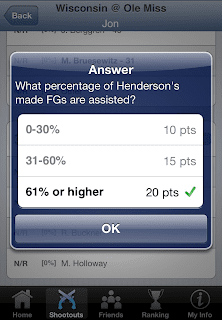 Henderson's only made FG was a catch-and-shoot opportunity off of a pin-down screen. While a chunk of his early attempts came from rushed, off the dribble looks, Ole Miss head coach Andy Kennedy knew which adjustments needed to be made. As the teams trotted back out onto the court, the new game plan quickly unfolded. 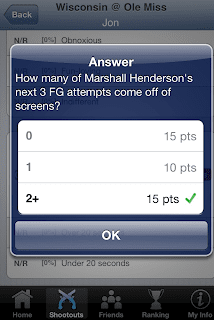 Once again, we asked, in real time, how many of Henderson's next 3 shots would come off of screens? Over the next few possessions, the Rebels' gunner ran off numerous screens under the hoop for quick catch-and-shoot opportunities beyond the arc. Once he got two bombs to fall, it was all over. Ole Miss didn't look back. There aren't many players in the country that can completely swing the momentum of a game in just two possessions, but that is exactly what Henderson did against the Badgers. In the second half, the sharpshooter finished 5-of-10 from the field, including three makes from beyond the arc. The junior college transfer has scored at least 18 points in nine consecutive games, and will look to make it 10 straight on Sunday in the Round of 32. Love him or hate him, basketball fans around the country have to respect his ability to make a key adjustment and to shoot through a slump against one of the nation's stingiest defenses. Want to see if Henderson can continue his hot streak? 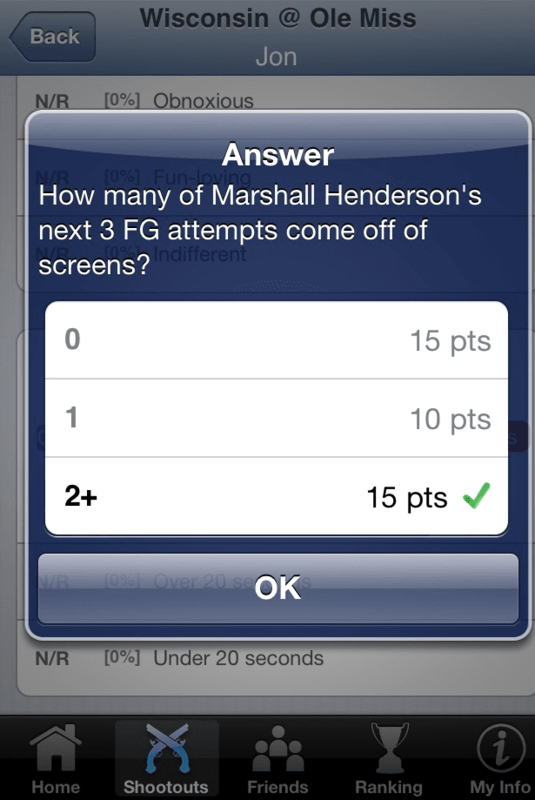 Download SnapCall Sports from the iTunes App Store and play along throughout the NCAA Tournament. You never know what this guy will do next.